This cooking mission of mine is all about discovery and this ingredient certainly was one of those. I have to confess something here, I had never tried quinoa until a month or so ago. For me, who has an absolute adoration for cooking yet not knowing what quinoa is or how it is even pronounced had me baffled. After paying a visit to the local market recently, I queued to pay for some essential ingredients for the evenings cooking. As I waited in line I discovered the pulses section in the corner of my eye. I noticed the quinoa and took a quick wander across to learn more about this food. There are oh so many health benefits of quinoa - gluten free. very high in protein and vitamins, high in fiber (more than most other grains, in fact), high in antioxidants and it has many more benefits as well. 1. Preheat the oven at 180º C. In a large bowl, add the pumpkin with a pinch of salt and a drizzle of olive oil. Mix through the pumpkin until fully coated in the oil. Scatter the pumpkin on a baking tray and put in the oven for 20 minutes or until colored and cooked al dente. 2. Meanwhile, in a small sauce pan on high heat add the quinoa and chicken stock. Bring to the boil and then reduce the heat and simmer for 12 minutes or so, or until the stock has been absorbed. 3. Heat a frying pan and then add a tablespoon of oil. Add the chicken breasts and fry until cooked through and golden on the outside. 4. For the dressing, add all of the ingredients into a mixing bowl. Whisk until combined. 5. For the salad, turn the quinoa into a mixing bowl. Add the spinach and cooked pumpkin and mix through. 6. 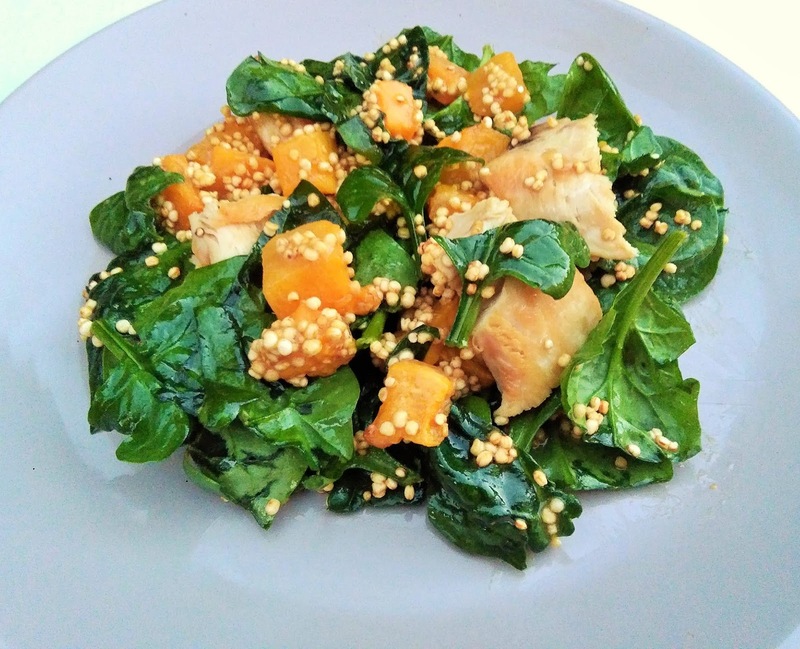 To serve, spoon the quinoa and spinach onto four plates and top with the chicken breast and cooked pumpkin before drizzling around the honey and mustard dressing.